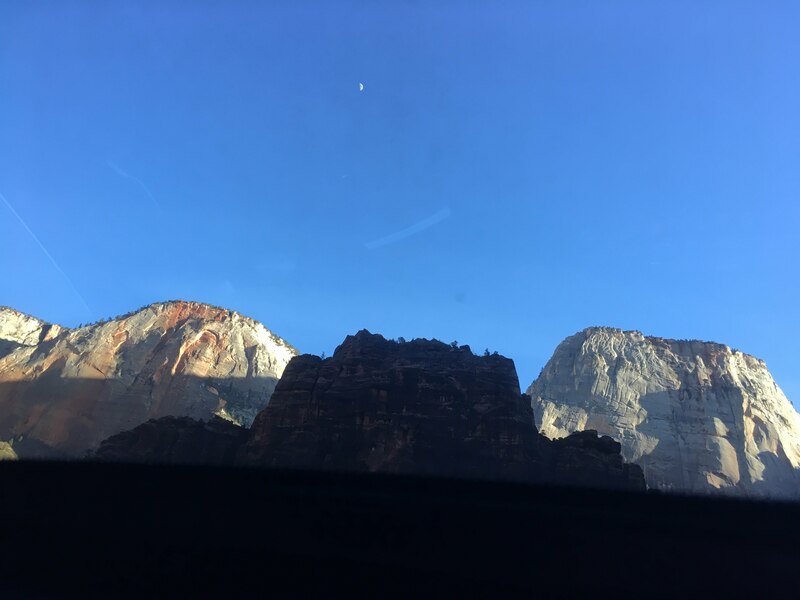 Glen Canyon Dam and Oh My – Zion National Park – Let's Go RVing! Since the government shutdown had closed the national parks Sunday and Monday we had been unable to visit Glen Canyon Recreation Area Visitor’s Center and Glen Canyon Dam. We had to be checked out of the campground by 11:00 so we got up early (it was difficult – my bed was warm and cozy and I could have stayed there another hour at least) and were at the Visitor’s Center for the dam by 8:00 for the tour. 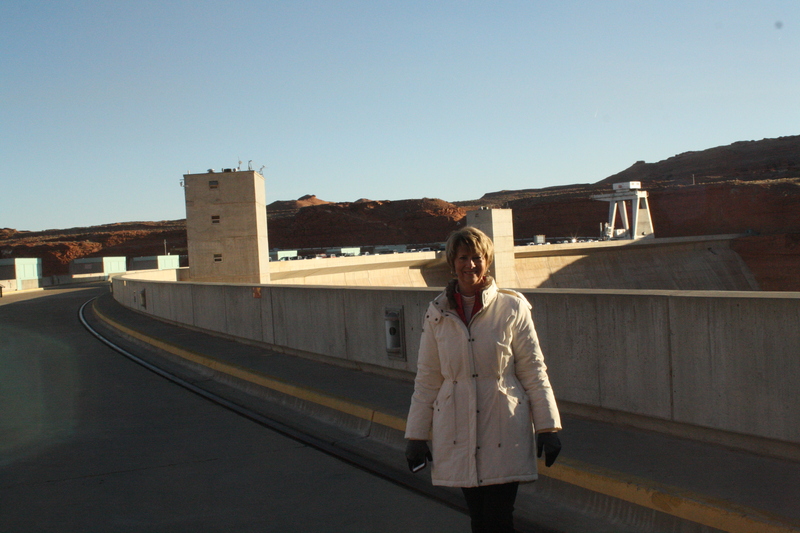 Glen Canyon Dam is a concrete arch-gravity dam on the Colorado River in north Arizona. It provides water to five states plus Mexico. Although the dam provides the water it is the responsibility of the recipients to get the water, e.g. lay the pipe, etc. The location for the dam was determined by choosing the narrowest place in the canyon with walls that were strong enough to support the weight of the water. Interestingly only 3% of water comes from rain, the rest from snow melt. The elevator for the lower part was inoperable so we were only able to go onto the dam but it was fascinating. Paul, our guide, was a retired policeman who volunteered as a guide. Besides the information he shared about the dam he also gave us some interesting information about Page. Page was only incorporated in 1957. Prior to the dam the area was just open land, one of the reasons that location was chosen for the dam. No one was displaced in the building of the dam. The workers came but only stayed long enough to work the dam and then moved on to other projects. Apparently the biggest business in Page is tourism which used to be heavy only in the summer months, June, July and August but recently the winter has been drawing tourists as well. The school system draws students from as far as 75 miles away from the Navajo Reservation. When we remarked about how far the students had to travel he said one got used to traveling if they lived in that area. When we were returning from Flagstaff yesterday we were behind a bus that was going pretty fast. Knowing the school buses in North Carolina can only travel 45 miles per hour we were amazed at the speed of that bus. We asked the guide about it and he said the speed limit for school buses was the same as for cars. I guess when you have to travel 75 miles one way to go to school going 45 would make an already long day even longer. Still it would seem that the students spend a great deal of time going to and from school. Then there are the after school activities that cause an even later departure. Before we left Jerry tightened up the 300 amp fuse plus we had the propane tank filled so we left a bit later than anticipated. We took the longer way to Springdale going through Kanab and then on 389 rather than 89 to avoid going through the tunnel. Perhaps we would fit but we didn’t want to take the chance. The day was sunny and a good day for traveling a wavy two lane road. We only had two stops for road construction and one 8% climb so not too bad. When we got to Hurricane I called the Watchman Campground in Springdale to see if they still had available sites. It’s a first come, first serve basis so before we drove all the way to Springdale I wanted to be fairly sure that they had a space. They told me that there was only one 50 amp and someone was in it but they were leaving that day so to come on so on we went and then we got to Springdale. The ranger had told me that there was some road construction in Springdale, what an understatement. There indeed was road construction all the way through the small town so it delayed our arrival quite a bit. They appeared to be repaving the highway so we had to carefully travel the narrow lanes. Upon our arrival at the entrance to Zion we were asked where we would be going when we left. When we told her she said that was good as we would not fit in the tunnel. Good to know I was right. The height restriction is 11’4” and we are definitely taller than that plus I hear that it is dark as night with the only light coming from the headlights and occasional air vent cracks in the rocks. Not somewhere I want to be! The ranger was not around when we arrived at Watchman campground so we had to decide where to park. It is a small campground so after we circled it (and put a long scratch on the coach from an over-hanging branch) Jerry just stopped and we got out to walk around and see if we could find a 50 amp. We quickly recognized the pull through with 50 amp that was occupied but were hoping there was another one. Yea! Jerry found the only other one, A1 so we began the maneuver to get the coach in. Between the rocks, the signs and the drain it was not easy. Jerry finally got out and I backed in perfectly with no problem but I had superb directions from Jerry on the ground. When I back up like that I never look where I am going as I keep my eyes on Jerry and listen attentively to his instructions. We’re a pretty good team! As soon as we got set up which was quick since we only had to hook up the power, put the jacks down and the slides out we had a quick lunch (at 3:00), made a couple of phone calls and then took off for the Visitor’s Center. We wandered around the gift store for a few minutes, got some park information and then decided to take the scenic drive since it was so late. Oh my! Again, another indescribable view. Such majestic mountains and I finally had a good use for out sunroof. We opened it and could not only look left and right but also up! The views were amazing but we only had our iPhones so we will be making another trip later to capture some of the beauty. As we rode along we saw quite a few mule deer who obviously were not afraid of cars. They barely looked at us as we passed. We returned to the coach intending to watch the sunset over the campground but got busy doing things and totally missed it. Oh well, we’ll be here for a few more nights. I have read that the sunrises and sunsets are phenomenal and as I know we will not be watching a sunrise I hope we can see some sunsets. I love Zion! It’s one of my favorite national parks.When we were there we had a site at Watchman and loved it. I’m glad you were able to get a site there. They must have changed the regulations about the tunnel. We went through it 10 years ago and I’m pretty sure we are taller than 11’4″. When we did it we had to go to the ranger station and pay a fee ahead of time. They stopped traffic going both ways. We were the only vehicle in the tunnel and drove through the middle of the tunnel. Maybe they don’t do that any more. Anyway, thanks for following my blog!